As a continuation of a drawing and text series produced during Gyun Hur’s time as writer-in-residence at Danspace Project Platform 2018, Gyun invited Helly Minarti, a visiting dance curator/scholar from Jakarta, to join her in performative writing on a Google doc as a response to a lively conversation she had with Helly at a café this month. As two creatives, they reflect on and unravel their own experiences with Danspace Project’s Platform 2018 Dancing Platform Praying Grounds: Blackness, Churches, and Downtown Dance curated by Reggie Wilson. (in)significant, pen on paper, 2018. Gyun Hur (Rail): Helly, so wonderful that we can continue the conversation here. 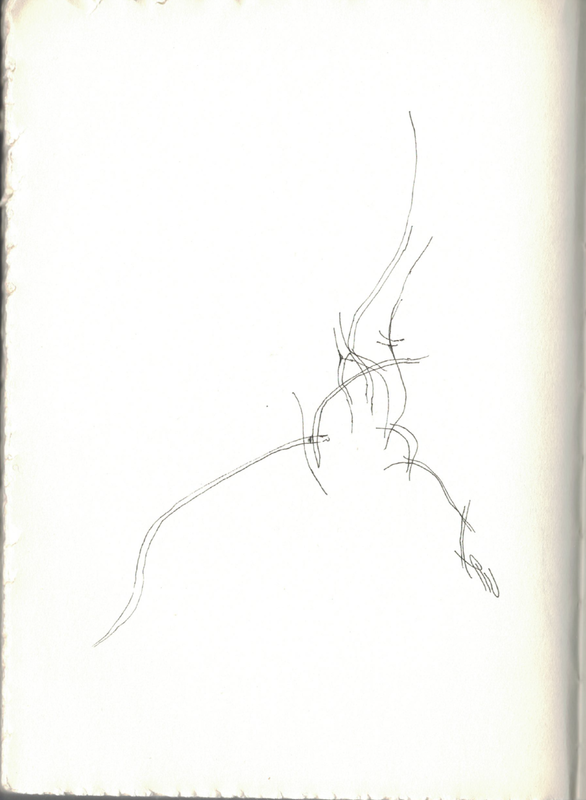 Here is my little sketch of a suitcase… I remember Reggie Wilson dragging that suitcase as an opening act of the performance …they stood shaking while others began to shout at Danspace Project. Do you remember? Helly Minarti: Of course! How could I not? The images that emerged from the festival’s closing work were quite strong. Rail: Mmm. ‘Elsewhere’ take me there. Outside of here, specifically, the New York contemporary dance scene? The centrality of American contemporariness? The sense of freedom in the work is rare, right… to claim these three distinctive entities—blackness, church, and downtown dance—and to thread them together as a body of work, not as a conclusive thesis, but more so as a research and a conversation that would lead us deeper within ourselves… That, to me, was an incredible journey. Minarti: All that—­but to begin with, religious practice or spirituality is not something that the ‘global’ contemporary dance scene would touch upon. At least not those circles/networks I have been encountering. Asian choreographers often struggle if they want to discuss these themes in their work, internationally, I mean. But New York in 2018 surprises me! Minarti: Reggie’s masterful embrace of many materials—from his decades-long research on various Africanist religious practices—seems to give his audience members permission to do the same. One thing that sticks with me is his own personal story of moving to NYC from Milwaukee and staying at the Judson Church dorm—a site he pointedly marks as a meeting place of postmodern/downtown dance and the Congo settlers. What strong imagery to have spurred him to do all those journeys. itinerant, pen on paper, 2018. Rail: As Reggie talked freely throughout the platform about his research and the places where he resided and by which he was influenced, I thought about the process of mapping one’s own consciousness. He was here, and there, and over there, and over here. That sort of locating oneself, then again dislocating… and collecting information and cultures and gestures… for a choreographic work was absolutely inspiring. I suppose that also allowed me to consider analyzing my own context of personhood; how my land, my body was colonized, in a way violated and dislocated… and how in all the work that I do as an artist and an educator is to reckon with that, to wrestle with what has happened, and to reacquire my “body as a valid means of knowing,” as Reggie Wilson says. Minarti: The body as a valid means of knowing! Yes. What I have observed during this short trip the last three months or so, is the unfolding story of America now, being an immigrant country. Minarti: Oh wow… I’ve heard “decolonizing” so much these days: uttered, spoken, and shouted. Saying something is always easy. But the next, more difficult step is to internalize it in one's bodily actions and attitudes. It is always a struggle—painful but a good and necessary one. Rail: Yes, it is a difficult process to untangle and embody something that you did not realize that you had, especially if your body, your land, had been ruptured or violated before you were born. I suppose that is why we need singing, shaking, and shouting... I recall Keely Garfield’s father song and Jonathan Gonzalez’ body shaking, and everyone coming together at Danspace during the platform collectively shouting… you know. How do you deal with all that loss without any sort of fanatic fictionality and religiosity? Minarti: I think—or I hope—there are many ways of dealing with it. Whichever way, it has to be honest. Rail: Honesty is another difficult one. Gosh, what would we do without performance and stage that guards a bit of that vulnerability? Minarti: You put it well! I just hope we always realize how powerful our (arts) practice is, and never really take it for granted. Rail: Are you looking forward to going back to Jakarta, Indonesia after a few months of your research here? Minarti: After four months in the cold, oh yes, I am looking forward to heading to sunny spots. Rail: You will have to pack. Rail: Yeah... have a safe journey back home, Helly.